In 2016, Amer also served as a surrogate for presidential candidate Bernie Sanders. In June 2015, Amer headlined at the world-famous John F Kennedy Center for the Performing Arts in Washington, DC. He produced this show as well, making it the first time that an all-Palestinian cast took the stage at the internationally-renowned venue. He is also the producer of the annual “1001 Laughs Dearborn Comedy Festival” in Dearborn, Michigan at the Arab American National Museum. Amer recently completed production on his first documentary film, “We’re Not White,” a comedic and informative approach to the Arab-American struggle to get a box on the United States Census Form. Join the Facebook Page here. 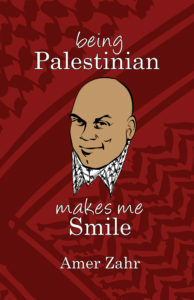 He is also the author of the well-read blog “The Civil Arab,” as well as his first book, “Being Palestinian Makes Me Smile,” a collection of his writings relating to being Palestinian. Amer holds an MA in Middle East Studies and a JD (law degree), both from the University of Michigan in Ann Arbor. He writes and speaks widely on political and social affairs, and has appeared on radio and television, including ABC’s “Politically Incorrect with Bill Maher.” Some of his writings have been featured in major publications, including Time magazine, and Al-Jazeera.